Christians long persecuted under the statutes are hopeful. 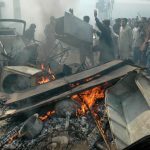 LAHORE, Pakistan (Morning Star News) – Gruesome violence against Muslims accused of blasphemy in Pakistan has reignited calls for amending blasphemy statutes commonly used to persecute Christians. The lynching of a Muslim student over blasphemy charges at a university in northwestern Pakistan, the murder of a blasphemy accused Muslim in Punjab Province and mob violence against a mentally challenged Muslim on similar accusations have compelled officials at high levels to call for changes in the widely condemned statutes. The National Assembly on April 17 passed a resolution calling for amending the blasphemy law to include strong safeguards to help prevent its misuse. At the same time, the Senate called for amending the statutes to provide punishments to those who concoct blasphemy accusations against others. A mob of several hundred students and university employees on April 13 murdered Mashal Khan, a 23-year-old student at Abdul Wali Khan University in Mardan, Khyber Pakhtunkhwa District, on trumped-up charges that he had blasphemed. The killing took place in the presence of police, with cell phone video showing officers facilitating the religiously-motivated attack. Police investigations later determined that Khan had not committed blasphemy, and that the university administration had plotted the mob violence against its own student for publicly criticizing the institution. The brutal lynching, which went viral in social media and received extensive coverage in national media, sent a wave of shock and panic through all sectors of society. It once again brought into the spotlight the controversial laws that since 1980 have claimed the lives of more than 65 persons, including Christians, in extra-judicial killings and mob violence. Khan’s death drew condemnation from all government tiers, including Prime Minister Nawaz Sharif and Imran Khan, whose Pakistan Tehreek-e-Insaf (PTI) is in government in Khyber Pakhtunkhwa Province, as well as several other political leaders. The Supreme Court took sou moto notice of the killing and ordered an investigation. But hardly a week later, on April 20, three women shot dead a 45-year-old man in the Pasrur area of Sialkot District, accusing him of committing blasphemy 13 years ago. A day later, a mob attacked and severely tortured a mentally challenged man inside a mosque in Chitral, Kyber Pakhtunkhwa District, accusing him of blasphemy. Six policemen were injured trying to rescue him. Calls to amend the blasphemy laws have been made before, especially after two high-profile political leaders – Punjab Gov. Salmaan Taseer and the first Christian minister for Minority Affairs, Shahbaz Bhatti – were gunned down by Islamist militants for demanding a review of the laws. The Khan murder, however, echoed loudly in both houses of Parliament, and, following army operations against Islamist militancy across the country, members of the National Assembly and Senate appear determined to take action. The resolution in the National Assembly was moved by Federal Minister for Defense Production Rana Tanveer Hussain, and all parties supported it. Denouncing the murder of Khan, the resolution also urged federal and provincial governments to take stern action against the perpetrators and facilitators of the killing, including those making hate speeches in the name Islam. Speaking to senators on April 17, Pakistan People’s Party Sen. Farhatullah Babar reportedly invoked the belief of a religious scholar who has proposed that accusers levelling false accusations of blasphemy should suffer the same sentences as those designated as blasphemers. He noted that a Federal Shariat Court decision has increased the maximum punishment for blasphemy from life imprisonment to death. Sirajul Haq, chief of the rightwing Islamist party Jamaat-e-Islami, reportedly told members of Parliament that a civilized society is defined by rule of law, and that no individual or group has the right to “punish” anyone even if they are guilty. Islamist opponents to reform remain. Maulana Fazlur Rehman, leader of the rightwing Jamiat Ulema-e-Islam (JUI), was among Islamist clerics who said they would challenge any attempt to amend the laws. He asserted that failure to implement blasphemy laws to punish blasphemers was the reason behind recent violence. Christian rights activists and lawyers believe the recent violence may push the government to consider reforming the laws, under which a mere accusation can land a person in jail for years awaiting trials and appeals. Attorney Saiful Malook, who is representing Aasiya Noreen (commonly known as Asia Bibi), a Christian mother of five on death row for alleged blasphemy, told Morning Star News that the killing of Khan and the reaction of political leaders has given him hope that some decisive action will be taken for reforming the laws. Saif said he had filed an application in the Supreme Court for early hearing of his client’s appeal against her death sentence, but that the justices had dismissed it. He added that Supreme Court justices are considering clearing the backlog of appeals before summer break, raising chances that Noreen’s appeal may be heard earlier. Attorney Anjum of the Lahore High Court, a Christian, is representing several Christians accused of blasphemy cases in Punjab Province. He said the recent killings of Muslims over blasphemy accusations may bring relief to the beleaguered Christian community, which has been living in fear since the laws were enforced in the 1980s. A 16-year-old Christian in Pakistan is languishing in jail under a baseless blasphemy charge after a judge declined to grant him bail earlier this year, Anjum said. The judge in Punjab Province’s Kasur District on Feb. 7 denied bail to Nabeel Masih, who has been jailed since Sept. 18, 2016 after a Muslim friend accused him of “sharing” and “liking” on Facebook an allegedly blasphemous photo of the Kaaba, the holiest Islamic site in Mecca, Saudi Arabia. Police are suspected of beating Nabeel until he confessed last year; he maintains his innocence. A massive attack on Joseph Colony, Lahore in March 2013 was sparked by a blasphemy accusation. 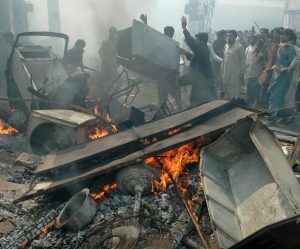 On March 9, 2013, thousands of rioters armed with sticks, clubs and stones besieged Joseph Colony and torched the houses in the predominantly Christian neighborhood following allegations of blasphemy against a Christian, Sawan Masih.